I estimate I have gone to dozens and dozens of conferences and large meetings and symposiums (I wondered how to spell the plural of symposiums and this is what I found). At first I thought I could say hundreds but that’s likely an exaggeration. The topic of conferences has been largely the profession of pharmacy, the world of pharmaceuticals, the evidence to support their effectiveness and how they are used. Add to that symposia about how we could better work together provincially, nationally and internationally and I am now thinking I should have kept a list. I’d be up for some sort of badge-if they gave badges for this sort of thing. I have given presentations (always telling a true story during the presentation), introduced speakers, chaired sessions and acted as a “discussant”. I had to ask what that was…besides someone who discusses things. For all those conferences, my husband and in years gone by, my daughter often attended and they did their own thing and joined me for various social functions during the conference. 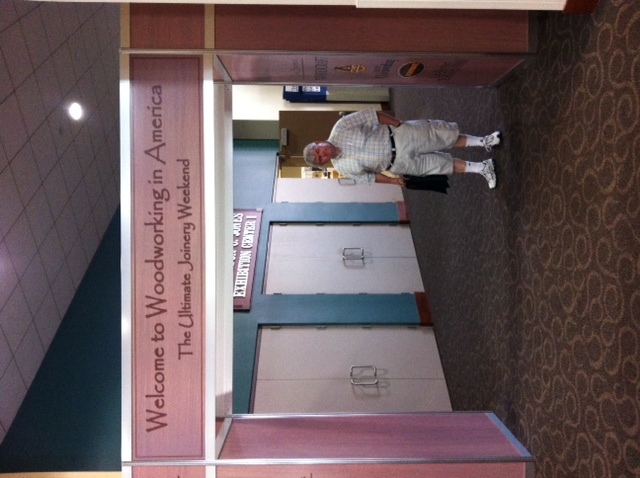 This week for the second time in our 36 year marriage, the shoe was on the other foot and I rode shotgun while my husband attended the Woodworking in America (WIA) conference in Covington, Kentucky. I walked over to the conference centre a couple of times and here’s my observations of the differences between conferences about drugs/pharmaceuticals, the profession of pharmacy and a conference about woodworking-or joinery as some call it. There is a great deal more facial hair at the WIA conference. There is more denim and plaid and vests worn….far more. You don’t hear much discussion about mortices and tenons at pharmacy conferences. You do hear about keeping things sharp at both conferences. 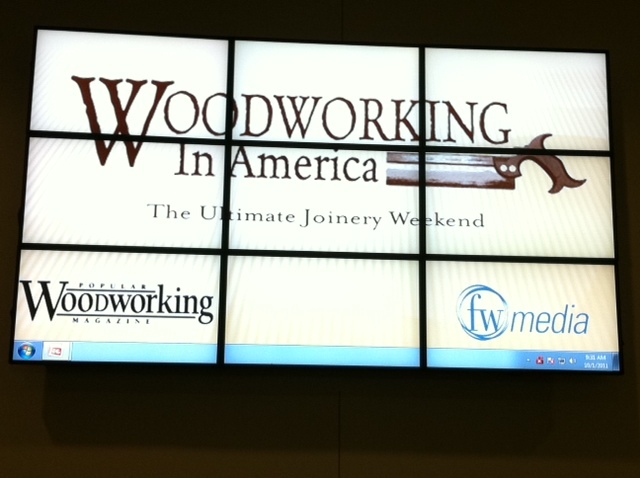 Both fine woodworking (joinery) and the profession of pharmacy are at the crossroads. I was intimately involved in the associations representing the profession of pharmacy for over 10 years and the profession was at the crossroads the whole time. It still may be. It’s a phrase I came to dislike…a great deal. Passion is evident at each conference-and that’s a great thing. People sharing the same interests and goals coming together-contacts and friendships made that will last well beyond the fleeting days of the conference. It’s great when your spouse indulges and supports your interest (I am so indebted it will never be an even split for us). Do you have thoughts about attending conferences and are there difference and similarities across the board? How would you spell the plural of symposium? we will never be even. Oh well. Was Red Green there? What is with the cross roads thing? Waiting for the light to change or what? Pictures of projects to follow and more analysis please. Red Green wasn’t there. The light at the crossroads must be orange signifying caution and impeding progress. We will do a blog about the conference with more detail-in response to your request and let us know what you think about it. More pictures is something I need to work on. Thanks for the feedback.